Editor’s note: As part of our Most Influential Post of 2013 contest, we are re-publishing the articles that attracted the most reads, social media shares and comments of the year. This article was the most-viewed for April. To see the full list of the most popular posts in 2013 and to vote for your favorite, click here. Impact investors focus on directing capital to companies that generate measurable social impacts alongside financial returns. This type of investment has grown significantly in recent years and many sectors have benefited—from microfinance and micro insurance to clean tech and sustainable agriculture. As more investors seek out options that fulfill the double bottom line concept, financial institutions serve the purpose of finding assets for those investments, helping grow the sector. In light of this, early stage business models must seek alternative sources of funding to scale up and generate impact. Having identified this gap, the IDB’s Opportunities for the Majority (OMJ) initiative has developed a portfolio of non-reimbursable technical cooperation grants to support pre-commercial pilots that are not yet ready for conventional loans but still have the potential to scale and replicate. The grants help companies pilot their models, prove their viability, strengthen the business model where necessary, and ready the company for more traditional sources of investment. We can equate these grants to angel investors, but for social enterprises. Though undoubtedly some businesses do not move past the pilot phase, these grants are proving successful in demonstrating the attractiveness of many models. A successful example is OMJ’s support of VisionSpring’s eye care model in El Salvador, which received a US$200,000 non-reimbursable grant. VisionSpring’s model relies on a network of micro-entrepreneurs that reach underserved patients in remote communities, and a series of optical stores that support their work. VisionSpring utilized the grant to scale up its operations in El Salvador by training micro-entrepreneurs and opening five storefronts. Only a year after receiving the OMJ grant, VisionSpring’s eye care model was producing significant social and financial returns. By the end of 2011, the model had empowered 33 micro-entrepreneurs, created 35 new full-time jobs, served more than 35,000 BoP patients, and sold in excess of 23,000 eyeglasses. Revenues also increased by more than six-fold from 2010 to 2011, and the model is expected to reach profitability by the second quarter of this year. The case of VisionSpring showcases the importance of strategic grants in bridging the financial gap experienced by business models in their early stages. Providing early capital to social enterprises can lead to businesses that can reach scale, have powerful social impact and provide returns on investment. Aware of this, OMJ launched eight new pre-commercial grants together with the IDB’s Multilateral Investment Fund (MIF) as part of its new Basic Services Business Accelerator Program. 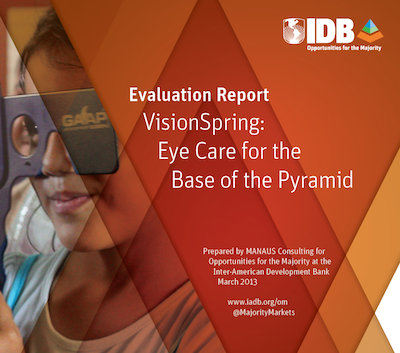 The program builds off of the success of Vision Spring, and the potential to leverage and scale innovative new models to serve the BoP in Latin America and the Caribbean. It made a selection process by the end of 2012 and is expected to allocate resources by July 2013. Carlued Leon is the global research manager at MANAUS Consulting, a consulting company that provides evaluation and strategy services in the areas of corporate social responsibility and international development.